Equity Plaza is being sold by DL Properties, which is 64.63 per cent owned by KepLand, with the remaining 35.37 per cent held by Alpha Core-Plus Real Estate Fund, managed by Alpha Investment Partners. KepLand said it expects to book a divestment gain of $59.5 million from the transaction, which is expected to be completed by the third quarter. The scheduled completion date is Aug 20. Completed 22 years ago, Equity Plaza is a 28-storey prime office building that has untapped gross floor area (GFA) of about 14,962 sq ft, which can be developed without incurring any differential premium payable to the state, BT understands. GSH chief executive Gilbert Ee said the group intends to retrofit Equity Plaza to be "on par with the top buildings in the area and believes that the subsequent investment to upgrade the facade and overall quality of the building will position the group to realise substantial value from the acquisition in the near future". Vibrant's CEO and executive director Eric Khua said Equity Plaza has the "inherent quality of a good location and can be held as an investment for rental and capital appreciation". Analysts say the additional GFA could potentially be built atop the existing building, though an easier option would be to build it in the voluminous lobby area where the new space could be used for food and beverage outlets. BT understands that the authorities have granted outline planning permission for strata-subdivision in the building. This opens the possibility for the new owners to proceed with strata subdivision into smaller units for sale, note industry observers. A name change for Equity Plaza could also be on the cards. GSH - which stands for Global Strategic Holdings - was a struggling consumer goods distributor that took on new life as a property developer after Mr Goi boosted his stake in the company and took a more active role a couple of years ago. The company, formerly known as JEL Corp, has its headquarters at GSH Centre along Changi North Way. Mr Goi, who is GSH's executive chairman, said in a statement yesterday that Equity Plaza will be the group's first acquisition in Singapore. "Investing in a superbly-located prime Grade A commercial real estate such as Equity Plaza presents a strategic opportunity for the group." GSH's current portfolio includes three residential properties under development in Kuala Lumpur and Kota Kinabalu. It also owns Sutera Harbour Resort in Kota Kinabalu. Equity Plaza is opposite Prudential Tower, where Keppel Land's sponsored real estate investment trust Keppel Reit last month inked a deal to sell its 92.8 per cent stake for $512 million, or about $2,316 psf on net lettable area, to a group comprising KOP Limited, Lian Beng Group, KSH Holdings and Centurion Global. CBRE introduced the consortium buyer in that transaction too. Jeremy Lake, executive director, investment properties, at the property consulting group, said yesterday: "The sale of Equity Plaza reflects the continued confidence which investors have in the Singapore office market." 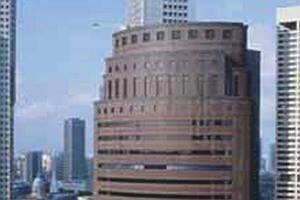 In January, Westgate Tower in Jurong East was sold for $579.4 million. KepLand said it expects to receive net proceeds of about $195.3 million from Equity Plaza's sale. Had the transaction been effected on Jan 1, 2013, the group's earnings per share for the year ended Dec 31, 2013, would have risen from 57.3 cents to 58.2 cents. Had the deal been effected on Dec 31, 2013, group net tangible assets per share would have increased from $4.52 to $4.56. On the stock market yesterday, KepLand ended one cent higher at $3.41, GSH closed unchanged at 7.5 cents, and Vibrant Group edged up 0.1 cent to 10.5 cents.